Here’s a paradox for you: Wi-Fi is everywhere, yet isn’t always easy to find. Here’s a possible solution: WiFinder by Lars Bergstrom is a handy utility for the iPhone or iPod touch that quickly locates and lets you connect to open, un-redirected wireless networks. How Open Was My Network? 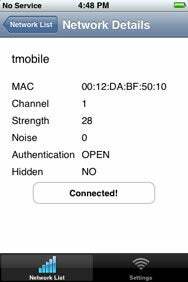 : Tapping for more info on a wireless network in WiFinder shows you data such as Media Access Control (MAC) address, channel, signal strength, and authentication type. Point of fact, WiFinder will show you all the networks in range of your device, open or not. It’s very good at that. But the app will only let you connect to open networks—most of the time. Here’s how the app’s simple interface works. When you launch WiFinder, the app automatically scans for any nearby wireless networks. The app will display what it finds with a red or green icon next to the network name, indicating whether it is open or closed. You can tap the network name to get more information, such as Media Access Control (MAC) address, channel, signal strength, and authentication type. If it’s an open network, you can then tap the Connect button and, in most cases, connect to the network. I discovered it often isn’t as easy as that, however. Some “open” networks still want you to register or sign in somehow, as I discovered an area bookstore. (And, incidentally, the Connect button also appears when you tap a password-protected network. The button is disabled.) When I could connect, however, I connected quickly and efficiently. I tested WiFinder over a few days in the course of running errands around my neck of Southern California’s Inland Empire. The app has no trouble locating wireless networks at all. I was walking down a major thoroughfare the other night and randomly checking for connections. I found three—including one open hotspot—within a 1.3-mile stretch. Not bad. You can also set WiFinder’s preference to automatically scan for open networks. The phone will buzz when the app makes a good connection. WiFinder is compatible with any iPhone or iPod touch running the iPhone 2.2 software update.